In a large pot, sauté onions with the olive oil and sugar over medium-low heat, stirring occasionally, for one hour. You want the onions to start to soften and caramelize. If they start to brown or stick to the pot, turn down the heat. After the onions have caramelized nicely, add in the minced garlic, and continue sautéing for 2 minutes. Stir in the flour and mix until combined. Add water, bullion powder and herbs to the pot, and turn the heat up to high. Bring to a boil and then turn the heat down to maintain a low simmer. Allow to simmer, uncovered, for 30 minutes. Fish out the bay leaves, and add in the soy sauce and vinegar. 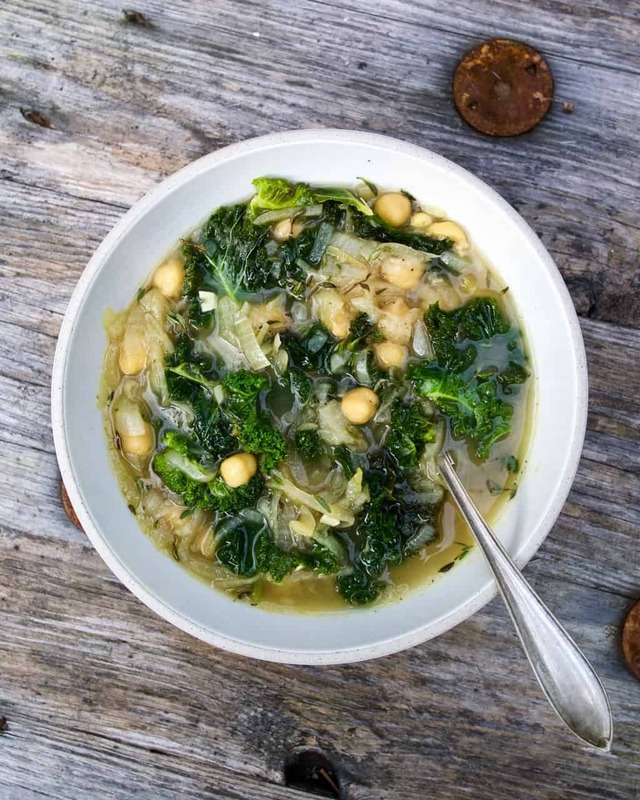 Stir in the kale and chickpeas and continue to simmer for 5 minutes until they’re heated through. Season with salt and pepper to taste, and serve immediately. Leftovers store well in the fridge for 4-5 days and in the freezer for 3 months.